A first visit to a destination spa dispels some of a skeptic’s misperceptions. Although I’ve occasionally popped into a spa for a facial, massage or pedicure while staying at a luxury hotel or resort, I had never before stayed at a destination spa—one housed in a setting focused exclusively on promoting health and wellness. For me, visiting a spa was never the main attraction of traveling; rather, it was more of a sybaritic footnote after active days exploring cities or relaxing on sunny beaches. 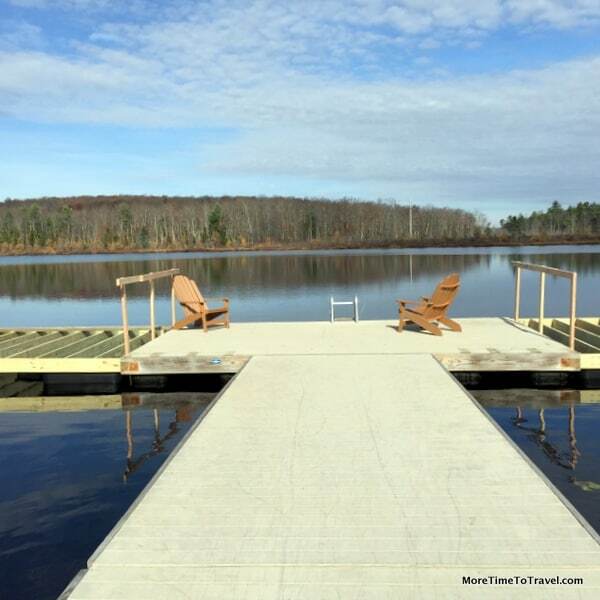 When my husband and I received an invitation to spend two nights at The Lodge at Woodloch, a destination resort spa, I worried that it might be a bad fit. Even though I didn’t really know what to expect, I thought I might feel like a fish out of water among very mindful health and wellness aficionados or, worse yet, that I might be signing up for a stay at a boot camp with rigid rules and restrictions. Even the idea of packing was daunting. I wouldn’t know what to wear. Yet, the brochure’s description of an all-inclusive getaway at an “award-winning destination spa resort offering an extraordinary respite for mind, body and spirit“ was compelling. A getaway close to home didn’t sound all that bad and the photos of the beautiful property were the clincher. I succumbed and made a reservation. The drive to The Lodge at Woodloch in Hawley, Pennsylvania was about two hours from our home in Westchester County, New York (The spa is about the same distance, 95 miles, from New York City). On a crisp fall day, we first crossed the Hudson River and then the Delaware Water Gap into Pennsylvania before we reached the winding country roads close to The Lodge that were sprinkled with summer camps and mostly seasonal cottages. With a population of just over 1000 people in the town, I must have blinked when we passed downtown Hawley. The Lodge sits on a gracious 150-acre property adjacent to a private lake, Little Lake Teedyuskung. Once we approached the treed circular driveway, a jovial gatekeeper signaled us inside. Soon after that, any lingering anxieties slowly began to dissipate. A valet parked our car, and our bags were efficiently whisked away by a bellman who delivered them to our room before we opened the door. At the front desk, after a quick credit card impression, a friendly woman welcomed us by name and handed each us key cards, large canvas totes and eco-friendly water bottles labeled with our names. Built in 2006, The Lodge has two wings. The one on the left houses all the guest rooms and the one on the right, a 40,000-square foot, multi-level spa. In-between them are inviting common areas including a living room, other relaxation spaces, and the 100-seat TREE Restaurant and Bar where meals are served three times a day. Expansive windows throughout the building almost bring the outdoors in. We were assigned to Room 212, one of 57 spacious (400-square-foot) guestrooms with a private veranda overlooking a garden. Although the property is intimate in size (numbers of guests), it also has eleven junior and one-bedroom suites with either lake or garden views. Fortunately, despite my fears, our room was not a technology-free zone. While cell phone use is discouraged in public areas “to cultivate an environment where nature nurtures,” our room had wireless Internet access and a flat-panel LCD TV. I don’t think I could have gone cold turkey overnight. Our room was clean, attractive and comfortable with double granite-topped sinks and a marble walk-in shower in the large bathroom. Our days were our own. Although activities are scheduled from morning to early evening (about 25 different ones each day), this is no boot camp. You can pick and choose what you want to do amongst the many activities offered daily, both at the spa and outdoors. Most instructors accept walk-ins, although a few require guests to sign up in advance with the concierge. An Outdoor Exploration Center offers open biking and geocaching between 9am-5pm. We signed up for a cooking demonstration offered by executive sous chef, Zach Smith, which was held in the modern chef’s kitchen next to the dining room. The dishes Chef Smith prepared were ones that could easily be prepared at home; they relied on healthful, local ingredients. As he cooked, he also shared helpful hints and information about technique (“Dijon mustard is a great emulsifier; Freekah is a nutritionally dense young grain; Use what you have in your kitchen; If you make your own salad dressing, you’ll know what’s in it). All the participants were able to sample the dishes and take printed recipes home. Worrying about what to wear turned out to be utterly unnecessary. Most people walked around, attended classes, and even dined in workout attire or in the plush white terry robes they found in their rooms. Everyone was carrying canvas bags with their program of classes, lectures and activities. Wallets and other valuables can be put away in room safes because, like a cruise ship, cash isn’t needed during a stay at The Lodge. The rules weren’t as stringent as I feared they would be either—the only welcome exception being that classes uniformly started and ended on time (Instructors were flexible and sensitive to the diverse needs of their heterogeneous attendees.). The three meals per day (included in the daily rate) were also forgiving: The gourmet spa cuisine menus had something for every type of eater (including those with food allergies and aversions). There were vegan dishes, gluten-free foods and even sinful desserts for the chocoholic. This wasn’t a “dry” spa either: Guests could purchase drinks at the bar or order them during meals. But “When in Rome,” travelers tend to follow suit. We did, too. We generally made healthy food choices, exercised in the 3500-square-foot Cardio Weight Studio each day, and joined beginner yoga and stretching classes. We spent time outdoors walking the two miles of paved and unpaved nature trails around the property. I still regret not having the time to sit on the Adirondack chairs and roast S’Mores with new friends around the picturesque outdoor fire pit. Spending time in the spa was a wonderful indulgence after an active day. I had time for one facial but guests can schedule massages, and other health and beauty treatments all day long in one of 27 treatment rooms. For those who love water: There are co-ed soaking pools framed by hydro-massage waterfalls; the indoor pool is designed for classes and lap swimming; and an outdoor whirlpool has a radiant-heat deck for year-round use. Over the two days of our visit, we were just able to scratch the surface in terms of doing all that was available at this four-season property, a place where nature always changes the views and the possibilities. I learned that a destination spa like The Lodge at Woodloch is a great place for relaxation and rejuvenation. Regardless of your age, weight, physicality or stamina, you’ll return feeling like you comfortably stretched your body and elevated your spirit. Men and Spas: What does it take to get a man to visit a spa? Disclosure: Our stay was hosted by The Lodge at Woodloch but any opinions expressed in this post are our own. And the pictures don’t even convey how beautiful it was in person! It must feel a little strange to wander around and eat in your bathrobe :-). But that solves the “what to where” dilemma and makes for a lighter suitcase. A restful way to spend 2 days, we’d say! What a beautifully serene setting. I would have wanted more than a couple of days, too! These escapes can be a good reminder to take better care of ourselves. So true, Betsy! Need to make time to capture the peacefulness of every day! Sigh. What a lovely mix of indoor and outdoor programs for a spa. I’m not a big spa-going gal but the few experiences I’ve had have been so nurturing I long for more. Lucky you! The Lodge at Woodloch looks and sounds wonderful. Although I fear I may be a bad fit and I always say I don’t have a bucket list, a few days to a week at a spa is on my bucket list. Looks like a terrific place, Irene. Like you, I’m not one who goes seeking the spa experience. But like you, I’ve learned that each spa will have its own character, and a destination spa with such variety is pure bliss indeed. When I saw Poconos I thought of heart-shaped bathtubs. This is 180 degrees from that. I like the idea of a wellness spa. I’d love to visit a spa for a few days, especially one in such a beautiful setting and I imagine the scenery on your drive to the spa was also lovely. Sounds like the whole emphasis was placed on the guest’s comfort (how nice not to worry about what you were wearing!) and relaxation. That’s my idea of a great time! There was definitely something for everyone! We used to ski in the Poconos when i was growing up. Plastic rain boots and push down bindings-yes it was quite a while ago. The Lodge at Woodloch looks like a wonderful spot to reacquaint my self with the area. Would love to borrow one of those bicycles, I like resorts that offer that option. The Poconos look like a beautiful spot for a healthy retreat and the Lodge at Woodloch seems to offer everything a wellness fan would be interested in. For me, the morning yoga, cycling and cooking demos sound ideal. Good too that it’s not too strict as I’ve been to destination spas where the vibe has been more boot camp than bliss and that can be a real adjustment. Yes, loved that the vibe was flexible enough to feel very comfortable. The picture with the Adirondack chairs above shows the view of the lake, Mike! Looks like a great way to spend a couple of days! Oh my goodness – I would do that in a minute! The photo of the chairs on the lake looks like a postcard! Lucky you! I’ve often worried I might get bored at a place like that but the woodland walks and the cookery lessons could keep me interested!